Place pork roast in a slow cooker. Pour water and BBQ sauce over the top of roast. Cook on low for 4-6 hours. When cooked through, shred. Reserve 1/2 of the pork for another meal. In a bowl, whisk together soy sauce, sesame oil, garlic powder, onion powder and ground ginger with a few dashes of pepper. Pour over pork and mix well. 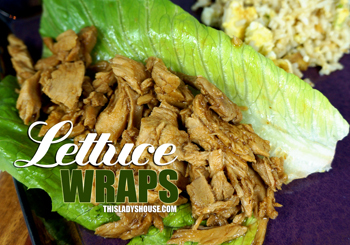 To serve place shredded pork on a crisp lettuce leaf and top with grated carrots, wrap and enjoy! This entry was posted in Recipe and tagged Crockpot, Dinner, Pork.